Enadoc helps efficiently organize all important office documents – from storing, archiving to retrieving. This eliminates the burden to tidy up papers bulk that only end up cluttered in storage drawers. Enadoc has been proven useful over the years – and the results are astounding. But still – and unavoidably – users still have queries on using Enadoc. That’s why we have decided to round up some of the frequently asked questions (FAQ):. Question 1: What is the cloud? Answer: Cloud computing is basically the big datacenters behind much of the Internet today. Most popular applications and services we use online are cloud based: Gmail, YouTube, Hotmail, Amazon, Facebook, Dropbox are all cloud services. We use Microsoft Azure platform, which provides the best security and redundancy since Microsoft have datacenters all over the world. Question 2: How can we be assured that our data in the cloud is safe? Answer: By standard, the cloud service providers invest the most in protecting data, invest most in hardware and software as well as expertise. The data breaches that we all hear about are not related to cloud security but mostly are user names and passwords that have been stolen outside the cloud from application in the cloud; it’s not like an employee opened the door walked in and picked up something and exposed it. Question2a: How is Enadoc securing the documents and log in details? Question 3: Does Enadoc support multiple libraries? Answer: Yes! By default, we give our client 2 libraries upon subscription. This can be increased through an upgrade, depending on our client’s needs. Question 4: What is Tag Cloud? Answer: A Tag Cloud is a visual representation of all the tags associated with documents, simplifying the whole document indexing process. We are proud to be the only solution to use the Tag Cloud feature in the field of document management. Enadoc uses mathematical algorithms to identify the frequency of each tag or keywords within the organization’s repositories. The user has several options to structure the appearance of Tags themselves, example alphabetical order, recently searched, most tagged, and so on. Question 5: What are the supported files in Enadoc? Question 6: Why Tech One Global? Answer: Because we’re already fifteen years in the Document Imaging (management) Industry and more satisfied clients installed in several countries than any other company in our industry in this region. Question 7: What are the advantages over other document management solutions providers? Answer: Enadoc is our own product, and is economical compared with other DMS. It has advanced security features, mobile-ready, and is already on-cloud. And we have a build in capture (scanning) application. Question 8: Can Enadoc be easily integrated with other systems, like ERP, etc.? 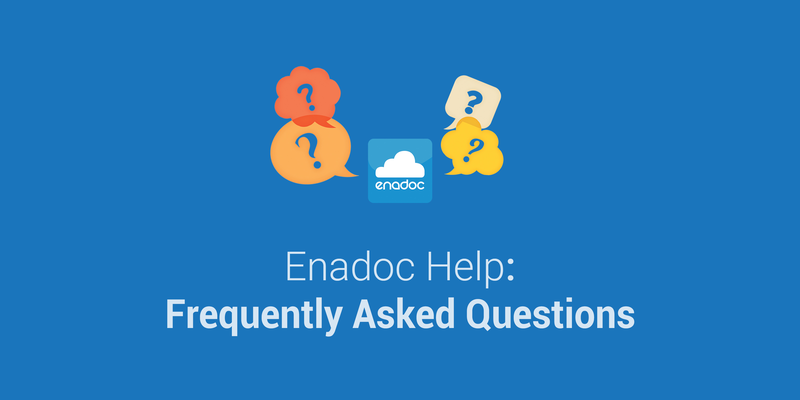 Answer: Yes, Enadoc is an ODBC (Open Database Connectivity) System, which can be easily integrated with third-party applications. Our services also include custom integration and consultancy on best practices around document management. Question 9: Our Company wants to manage our documents more effectively and is looking for a Document Management System. Where do we begin? Answer: for a simple implementation, just use our best practice out-of-the-box implementation; but if a larger organization wants a more comprehensive solution, we need to understand the need for DMS, like where will it be used for, how many users, etc. Question 10: Is Enadoc expensive? Answer: Since Enadoc is Software as a Service (SaaS) on Infrastructure as a Service (IaaS) there is very little upfront cost and no purchase of servers, server software, and such, that needs to be considered. The only capital expenditure is associated to scanner hardware, which can also be leased. Question 11: Is Enadoc legally compliant? Answer: Yes, Enadoc can help any business gain compliancy through a number of mechanisms. Documents are held in a way that results in them being classified as legally admissible. Documents cannot be changed or altered once uploaded in Enadoc. In addition, the system includes an audit trail of all activities, and the facility to ensure that records will not be modified in any way. Question 12: Can the multi-function scanner work with the Enadoc Capture? Answer: Yes! Enadoc Capture works for Upload (where we can access data through a Network Folder) and Capture or Scan from a TWAIN Driver Scanners, which is connected on the PC. Question 13: Does it mean that once we subscribe to the Enadoc DMS, all our data are already backed up and replicated? Answer: Yes, Enadoc is a complete document recovery and backup solution, no additional procedures or systems required. Question 14: Do we also have a Document Life Cycle Management, where we can set the retention of our documents? Answer: Yes. This can be managed in Enadoc. Question 15: With the free storage, how much documents can be stored? Answer: Approximately, 300,000. It’s means 115-page per day every day for 10 years. Because we use cloud storage, we can upgrade or downgrade storage at any time and users will only pay per consumption. Question 16: You said Disaster Recovery. Can you site some instances that a disaster recovery feature is really useful? Answer: We live in a time and place where anything can happen any time – natural disasters are in the news every day, fires burn down entire companies and mechanical faults can cause flooding or a simple leakage dripping water on a filing cabinet can occur over the weekend. Best evidence always prevails. We hope we have already covered what people are having questions about. If you have further questions, queries, suggestions, or testimonials about Enadoc, drop us a line at bit.ly/Enadoc or shoot us a message on Facebook at bit.ly/EnadocFacebook. Thinking of a friend who might be helped by this? Share this via the social buttons below!